Marriage being sort of a turning point in life, wedding ceremony and everything related to it has always been accompanied with variety of traditions and beliefs, some rooted in hoary antiquity, some recently devised, but all targeted at bringing good luck to the newlyweds and averting misfortune from them. So if your bride or bridegroom is Russian or if you have been invited to a Russian wedding only as a guest so far it might be helpful for you to know a bit about this abstruse wedding ruse. Do Not Wed in May! Nowadays Russians still believe that marriages contracted in May are destined to be unhappy. There are even some sayings about this, like Good people do not get married in May. He’d be happy to wed, but May does not let. Those married in May will always pine. May is considered to be a “difficult month” and so any initiative undertaken in May is reportedly doomed to failure. Such a prejudice most probably owes its existence to the fact that “May” in Russian (mai) sounds common to the word mayatsa, i.e. “pine” or “suffer”. Words rule! Do Not Cross the Newlyweds’ Way! Nobody should cross the path in front of the bride and bridegroom neither on their way to ZAGS (Registry Office) and/or church and back. 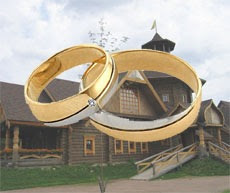 In Russian villages they still believe that only sorcerers and ill-wishers “cut the path” of the newlyweds to harm them. It reminds of the English token of a stone that rolls across the road in front of the newlyweds. Who’ll be the Head of the Family? It is believed that it is the one of the newlyweds who first steps on the wedding carpet in Registry Office, who is going to be the head of the family. The master of the house is also defined according to who is the first to step into the house (compare to similar English beliefs: who contrives to step out of the church building first or who enters the new house first will be the head of the new family). In some places there is a nice custom suggesting that the bridegroom steps across the threshold of the house carrying the bride in his arms. When meeting the newlyweds back from the Registry Office the in-laws treat them with khleb-sol (a round loaf with a saltcellar put on its top); the bride and the bridegroom must take a bite of the bread without touching it with their hands. Who takes a bigger bite is going to be the head of the family. If during the wedding, while putting the wedding ring on, the bride or the bridegroom happens to drop it, this is really bad omen. After the bridegroom has put on the ring onto the bride’s finger, she should not take the empty ring box. It is usually taken by the bridesmaid, who is willing to be married soon: then she is guaranteed to be the next to wed.
Another piece of advice to those eager to be married soon is to secretly pull to oneself the tablecloth at the wedding dinner. Or else, unmarried girls exercise in catching the bride’s bouquet, which she throws (only one time!) standing with her back to them. It is bad omen if something happens to bride’s shoes during the wedding; in particular, if the heel breaks off. By the way, there is a similar Celtic belief concerning a wedding glove, that happens to be torn, or a shoe, etc. However, shoes can also harbour luck! There is a well-known custom in Russia to put money into the wedding shoes. Russian brides like to put a coin under their left heels as they believe it will bring them luck. In the traditional Russian wedding, however, it was bridegroom to put money into his boots. Before the wedding night the bride would take his boots off in token of her obedience and he would give her that money. Don’t You Be a Cold Fish! Another interesting belief that stands fast all around Russia (I guess this country is not so original about this) is as follows: on the wedding night (no matter whether it is the first one or not) making love is a must for the newlyweds! If by this or that reason it fails (let’s say the wedding party has been too wild and long, the guests have stayed in all the night, the bridegroom is drunk, etc.) they believe that the newlyweds will not be happy in their family life. This somehow explains why the bride and the bridegroom are traditionally expected not to eat or drink much at the wedding feast. Slavic folklore, superstitions, old paganism has fascinated me since I was very young, because it was very different than the primarily western folklore, superstitions and paganism that filtered down to us here in America, which was largely based on either British or ancient Roman superstitions that had been passed on to western European cultures through the Romans. my grandmother used to tell me Slavic fairy stories or superstitions that applied to just about everything you did in daily life. There were all sorts of pre Christian superstitions and rituals practiced that somehow became linked to various days on the Chrisian calendar. This of course occured in western Europe, but because they were so different from those practiced in the western world, they would of course be a source of endless entertainment for a child. Even though a large percentage (the majority, I think) of Slovaks were and are Catholic, there were so many differences between Catholicism as it is practiced in the United States or even in Western Europe that it still seemed so very different than the practices taught in the U.S. which are so bland and unispiring to American Catholics that a good percentage of them will state their religion as Catholic, but more than half never go to church and more than half do not accept the positions that is part of official church doctrine. My Grandmother was Lutheran, but her religion seemed to have more in common with my Grandfathers Uniate Catholicism than either did with American Catholicism. Today there is a revival in both the Catholic and Orthodox churches in the United State in which many of the cultural traditions that were common practice in many areas of Europe are being revived. St Lucia's day, which is linked to many pagan winter festivals, is seeing a large revival in the United States, which is and was practiced in similar ways from Scandanavia in the North, to Sicily to the South, to Portugal in the West and to the Central European nations like Poland, Slovakia and the Balkans in the East. But to a child, most of it was magically different than the everyday practices and tales we were more familiar with. I like to read folk stories of different nations. Once I had tried to read the book "The folk-tales of British isles" before the sleep, I read only one of these tales, but it frightened me so much, that after I couldn't fell asleep all night long)). That's sort of what I mean. Western folk tales were never very frightening to me as a child, I suppose, because many of the cultural references were so familiar to me. But many of the slavic folk tales and myths were much more frightening because the references were not as familiar. After hearing stories about the leshy or rusalka or polevik or vodniki or vili as a child, when walking through a small wooded area, or past a lake or river, I would alway be looking back, just to make sure. Especially scary was the fact that slavic nature spirits were just as incline to be seen in daylight, while in most western tales, the activity of malevolent nature spirits seemed to be limited to the nighttime. But the stories of fairies and gnomes and dwarves and such made them. Baba Yaga was always the most frightening, especially with regard to children. Western stories of evil witches were more incline to amuse me rather than frighten me, but Baba Yaga always was very, very scary. This blog is very informative. It is very interesting and i have enjoyed reading it. Thank you for sharing your ideas about the law of attraction. I'm happy i found your site.